Resonating tubes make music from highway overpass. Artists Bruce Odland and Sam Auinger affixed two 16-foot-long resonating tubes to the bottom of a highway overpass, and placed microphones at specific intervals to pick up both the sound of traffic and passing pedestrians. 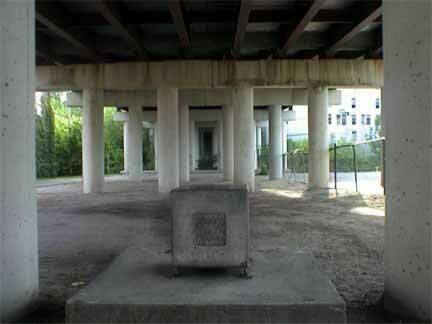 The sounds travel down to speakers encased in concrete cubes on either side of the road below the bridge. The hum generated by the device is a droning C, one so low its sound wave is 16 feet long (the reason for such long tubes). 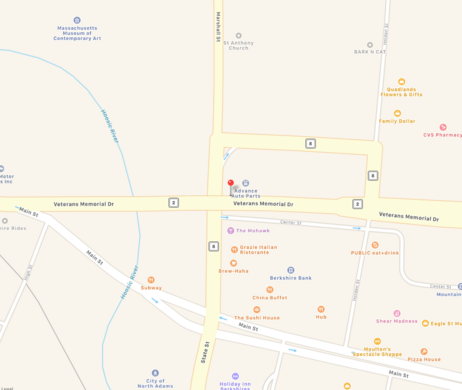 The droning is a subtle presence that blends with the sounds of passing cars, creating a unique sonic experience in a seemingly unimportant location. An instrument literally played by the city, one whose melodies are harmonious with the overall landscape of sound in the urban world. 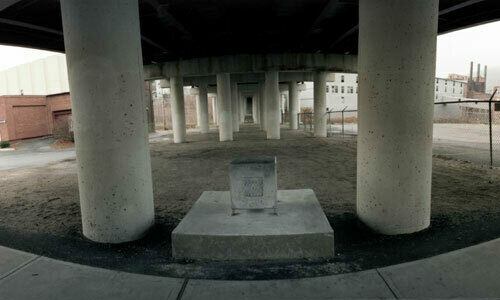 The concrete block pictured, where the sound emanates is off Marshall Street, under Route 2 (Veterans Memorial Drive). Naturally formed white marble arch housed in an abandoned marble quarry from the 1800s. Yup, that's a 330-foot yacht passing over the highway.